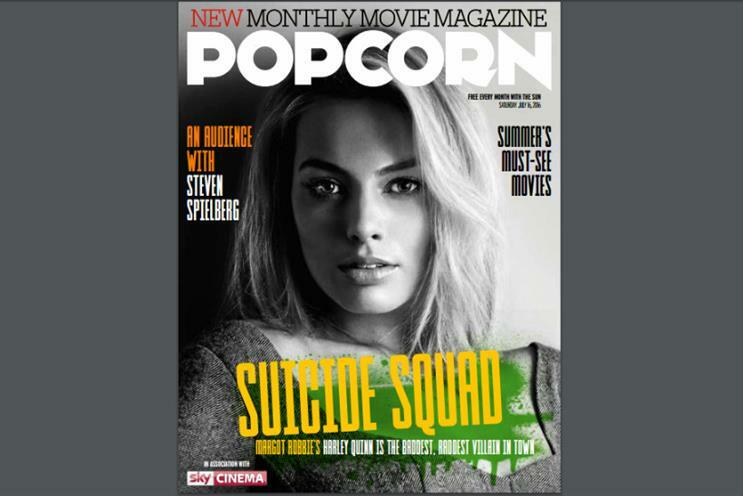 The Sun newspaper has launched Popcorn, a monthly film magazine, in time for the launch of Sky Cinema. Sky Cinema is the lead sponsor for the new 28-page magazine, which will be distributed with the newspaper's Saturday edition and online. James Hawker, director of entertainment, telecommunications and broadcast at News UK, said the partnership "could not have been better timed", given the relaunch of Sky Cinema last week. The new channel is effectively a rebrand of Sky Movies and has released a launch campaign by WCRS. The Sun claims the magazine, with a circulation of 2.4 million, will become the largest film title in the UK. Popcorn aims to be the "go-to monthly" for families. It isn't clear what other brands feature in the launch issue of Popcorn. Sky Cinema's sponsorship gives it branding on the front cover, display ads online, sponsored editorial and an online takeover of The Sun's film channel. The magazine will also feature a section called Microwave Popcorn, a guide to what readers can watch on Sky Cinema. The first issue of the magazine lands on Saturday (16 July).